Even if remodeling isn’t possible, you can add simple elements to an existing bathroom to create a relaxing oasis. We asked Crupi and Anna Hardy Evans of In-Home Decor and More in Exeter how to create a spa oasis in your home. Modern bathtubs come with a variety of optional amenities, including massaging jets, molded armrests and even programmable settings like water temperature and level. Designed by David R. Crupi, LLC. If your idea of luxury is sinking into a tub of fragrant bubbles or bath oil, there are plenty of options. “Tubs come in all shapes and sizes, with different amenities,” says Crupi. A deep soaking tub with a contoured back and molded armrests allows you to warm your arms under water. Looking for a massage? An air-jetted tub offers a gentle massage or a steady stream of water, depending upon the experience you desire. Set water level and temperature in advance of your bath in a programmable tub. Complement your mood in a tub with chromatherapy lights that enable you to choose different colors. 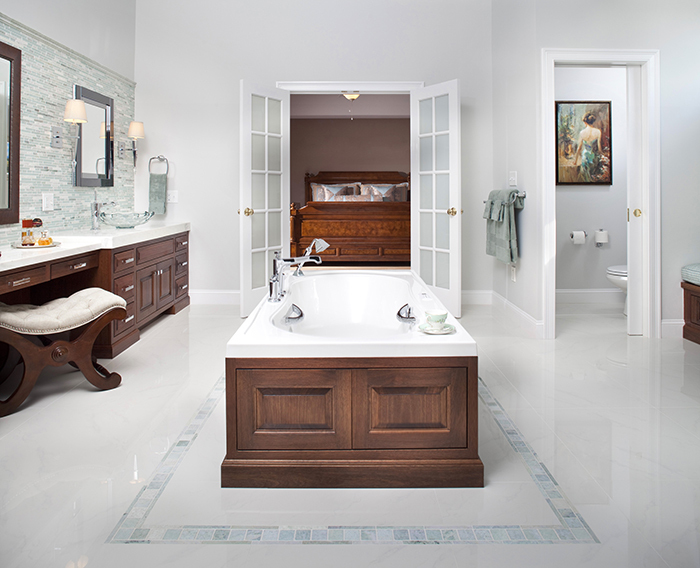 For built-in tubs, a tile surround adds beauty and a contemporary touch. Crupi recommends different-sized subway tiles or mosaic tile, depending upon your budget, to create borders and update a bathroom. Evans installed a see-through fireplace at the foot of the bathtub in her master bath. “It’s relaxing to look at and throws off warmth,” she says. Programmable showers offer the height of luxury. Designed by David R. Crupi, LLC. There are lots of options for updating a shower. High-end options include building a programmable shower with all the bells and whistles: marble tile walls, a glass door with a top awning window to release steam and a variety of different shower heads or sprays individually programmed to suit any bather in the household. A hand-held, multi-use shower head offers flexibility with different types of water sprays and multiple settings (it even helps make cleaning the shower easier). If a fixed shower door isn’t an option, a curved curtain rod creates more width than a conventional straight rod. “You can invest in a few yards of beautiful fabric and bring lots of color and texture into your bathroom that way,” says Crupi. lotions, shampoos and creams into bottles and jars with vintage-look labels. “It gives them a nice, uniform look,” says Evans. No matter what your budget, Crupi adds, make sure your shower and tub have safety features to prevent scalding. After a bath or shower, nothing feels better than stepping onto a warm floor or wrapping up in a thick, comfortable towel. Radiant heated floors keep feet toasty year-round. Another option, notes Crupi, is installing porcelain floor tile, which isn’t as cold as ceramic tile. A wall-mounted, heated towel rack ensures towels are warm when needed. Another option: Evans recommends putting towels in the dryer before your bath, then rolling them up tightly, keeping them warm longer. Upgrading the quality of your towels to a high-grade cotton creates a cozier experience as well. Bathroom lighting affects more than mood. If possible, install side lighting around bathroom or vanity mirrors. “Above mirror lighting throws shadows on your face, making you look better, but lighting at eye level is better for grooming,” Crupi says. She suggests vanity sconces at eye level, preferably both to the right and left of the bathroom mirror. Other simple additions can transform your bath. Touch up the space with paint; color enlivens and enlarges the space visually. For atmosphere, candles are always a special touch. Evans also enjoys a touch of scent. “Use natural oils and don’t overdo it,” she says (a favorite is geranium oil). 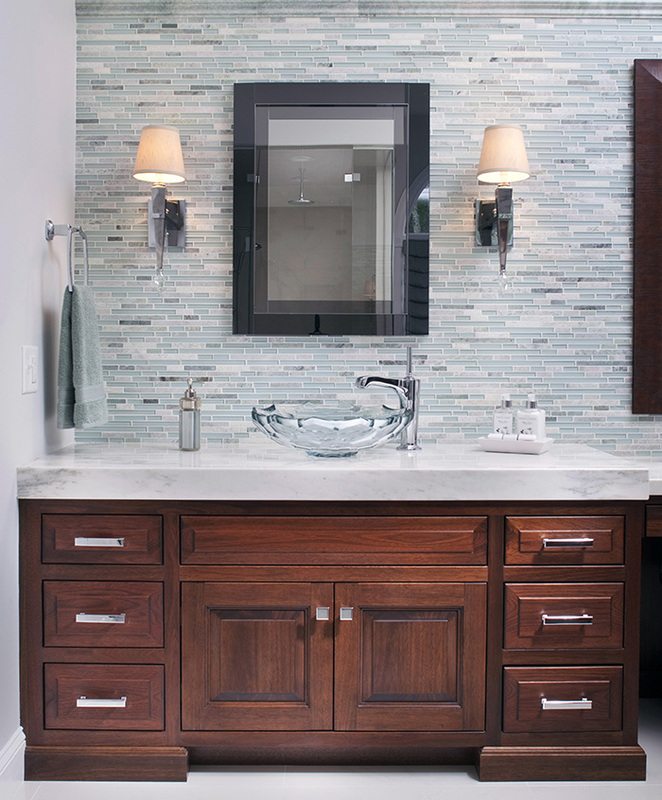 Make your bathroom a relaxing retreat and you’ll enjoy it for years to come. Curious about what a programmable shower means? Kohler offers the DTV Custom Showering Experience (pictured) that creates a spa environment right inside your shower. With the touch of a few buttons, you can control water temperature, intensity and angle, create steam, change the color of the lighting or even play music. It comes with presets or you can save your preferences for easy access every day. You can learn more at us.kohler.com and you can visit local bath showrooms such as Standard of New England (100 West Rd., Portsmouth); Frank Webb’s Bath Center (various locations; see frankwebb.com for a list of showrooms in New Hampshire); and the Ultimate Bath Store (various locations; see ultimatebathstore.com for a list of showrooms in New Hampshire).